Saidina 'Umar also lived by trade. When he was made Khalifah after Saidina Abu Bakr RA , he assembled the people and said to them: "I earned my living through trade. As you people have engaged me as Khalifah, I cannot attend to my business. What about my living?" Different amounts of daily allowance from the Bait-ul-Mal were suggested by different people. Saidina t Ali did not speak. 'Umar inquired of him: "Oh Ali what is your suggestion?" He replied: I suggest that you should take an average amount that may be sufficient for your family." Saidina Umar accepted his suggestion and a moderate amount was fixed as his daily allowance. Later on, some people including Saidina Ali RA , Saidina Uthman RA , Saidina Zubair RA and Saidina Talhah RA once proposed that Saidina Omar RA allowance might be increased, as it was hardly sufficient for him, but nobody dared to suggest that to Saidina 'Umar . People approached his daughter, Ummul-momineen Saidina Hafsah , and requested her to ascertain Saidina 'Umar's RA reaction to the suggestion without mentioning their names to him. When Saidina Hafsah talked about it to Saidina Umar , he became angry and said: "Who are the persons making this suggestion?" Man should be humilated the 2nd time. Saidina Hafsah requested: “First let me know your opinion.Saidina 'Umar RA replied: "If I knew them, I would smite them on their faces Hafsah! Just tell me what was Nabi's SAW best clothing in your house?" Saidina Hafsah replied: "It was a pair of reddish brown clothes, which Nabi SAW wore on Friday or while receiving some envoy." Saidina Omar asked: "What was the best of food that Nabi SAW ever took at your house?" Saidina Hafsah replied: "Simple barley bread was the only food we used to take. One day I spread a piece of bread with the remains of an empty butter tin which he ate with relish and offered it to others as well." Saidina 'Umar asked: What was the best bedding that Nabi SAW ever used in your house?" Saidina Hafsah replied: "It was a piece of thick cloth. In the summer it was spread in four layers, and in the winter in two layers, half of which he spread underneath and with the other half he covered himself." Saidina 'Umar advising Saidina Hafsah said : "Hafsah! Go and tell these people that Nabi SAW has set a standard by his personal example. I must follow him. My example and that of my other two companion’s viz., Nabi SAW and Saidina Abu Bakr RA is like that of three men traveling on the same road. The first man started with a provision and reached the goal. The second followed the first and joined him. Now the third is on his way. If he follows their way, he will also join them, otherwise he can never reach them." Such is the life of the person who was feared by the kings of the world. What a simple life he lived! Once, while reciting the Khutbah, it was noticed that his lower cloth had as many as twelve patches, including one of leather. Once he came late for his Jumu'ah prayer and told the congregation: "Excuse me, people! I got late because I was washing my clothes and had no other clothes to put on." Once he was having his meal when 'Utbah bin Abi Farqad asked permission to see him. He allowed him in and invited him to share the food with him. 'Utbah started eating, but the bread was so coarse that he could not swallow it. 'Utbah bin Abi Farqad asked: "Why don't you use fine flour for your bread, 'Umar?" Saidina 'Umar asked: "Can every Muslim afford fine flour for his bread?" 'Utbah replied, "No. Everybody cannot afford it." 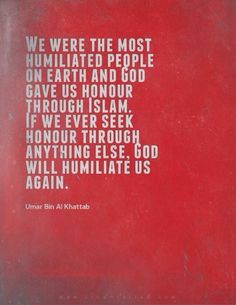 Saidina 'Umar remarked, "Alas! You wish to fulfill all my pleasures while I am in this world." 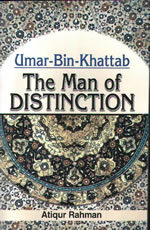 There are thousands of such stories about the illustrious Sahabah Everybody should not try to imitate them, for we lack the physical strength of those people; and that is why the Sufi Sheikhs of our time do not recommend such exercises which tax the body too much, as the people are already low in physical strength. We should however keep the life of the Sahabah as an ideal before us, so that we may at least give up some of our luxuries and lead a simpler life (judged by modern standards). With the Sahabah's lives as an ideal, we can at least feel ashamed when competing with one another in running after the luxuries of this world.